The Teensy is a breadboard-friendly development board with loads of features in a, well, teensy package. 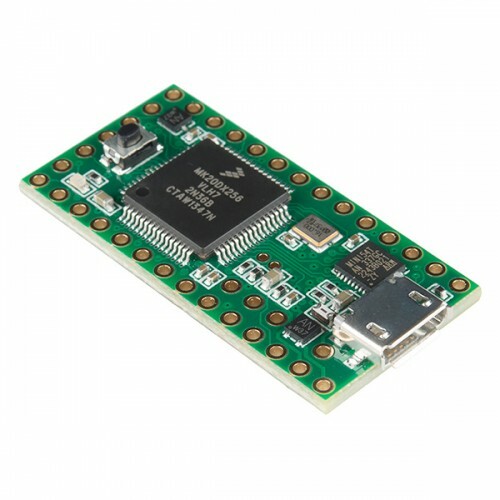 Each Teensy 3.2 comes pre-flashed with a bootloader so you can program it using the on-board USB connection: No external programmer needed! You can program for the Teensy in your favorite program editor using C or you can install the Teensyduino add-on for the Arduino IDE and write Arduino sketches for Teensy! The processor on the Teensy also has access to the USB and can emulate any kind of USB device you need it to be, making it great for USB-MIDI and other HID projects. The 32 bit processor brings a few other features to the table as well, such as multiple channels of Direct Memory Access, several high-resolution ADCs and even an I2S digital audio interface! There are also 4 separate interval timers plus a delay timer! Oh yeah, and all pins have interrupt capability. Also, it can provide system voltage of 3.3V to other devices at up to 100mA. All of this functionality is jammed into a 1.4 x 0.7 inch board with all headers on a 0.1" grid so you can slap in on a breadboard and get to work! The Teensy 3.2 adds a more powerful 3.3 volt regulator, with the ability to directly power an ESP8266 Wifi, WIZ820io Ethernet, and other 3.3V add-on boards that require a little more power. Additionally, if it is used within the Teensy 3.1 limits of operation, the Teensy 3.2 and 3.1 are interchangeable!